Jake and I love pizza. We eat it entirely too often. Sometimes we get it from our favorite local pizza joints (Garabaldi's, Little Italy, Memphis Pizza Cafe), sometimes from a delivery place (Pizza Hut thin crust or Papa John's regular), but sometimes we make our own pizza. We try to switch things up when we make our own pizza. A few pizzas ago, we made one with a pesto sauce. Last time, we made a Chicken Ranch pizza with a (you guessed it) ranch sauce. 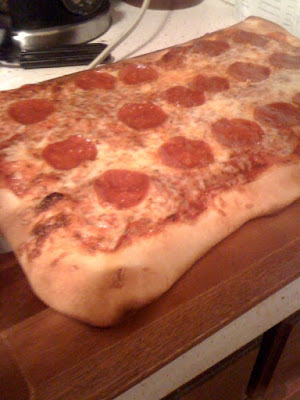 Tonight, we went for the straight and narrow and made a pepperoni pizza with a traditional sauce. 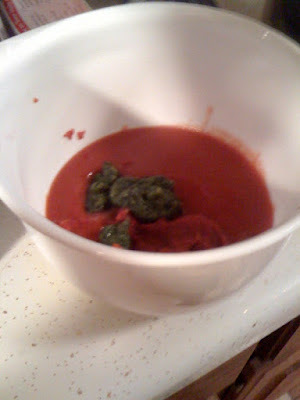 We used to buy jarred pizza sauce but had been opting to make our own lately. We had been using a combination of diced tomatoes, olive oil, minced garlic, and italian seasonings and that was working quite well. I know this picture is slightly revolting but that is why I wanted to post it. The excrement looking goop is the product I reviewed below. Mix it all together. Preferably in a bowl. Put on pizza crust of your choice. Top with some pizza toppings. 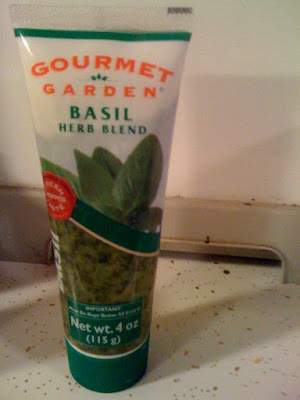 You use the same amount as you would of the fresh stuff and while it looks like goo, it tastes excellent. And you just squeeze. No chopping necessary. It keeps in the fridge up for a while, I think up to 6 weeks? For those who are curious, here's our final product. We shredded our own cheese for this one, using a Monterey Jack and White Cheddar combination. Oh and tip for you all - if you're buying pepperonis for your pizza making adventures, the ones in the pack are expensive and we don't use them all before they go bad. We started getting a container from the salad bar and putting enough pepperonis for our pizza in it. They weigh by the pound and I think these pepperonis cost us like .13 cents or something. I'm just sayin'. By the way, for those who have been keeping track of me on facebook, yes I'm still spinning. Keeping it up! I went straight from spinning to cooking dinner tonight and took my shoes off in the kitchen. Tyson clearly was offended. 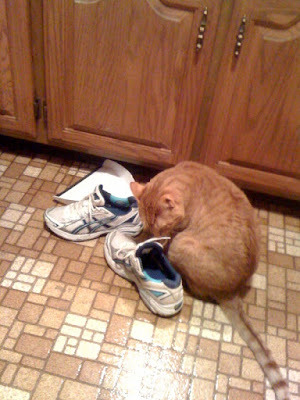 Either that or interested in what deliciousness was growing in my sweaty shoes. Yum!